"Everything a young artist needs to start creating original works in any medium. Featuring a Beka Double-Sided Paper Holder Easel with Paper Cutter and a whole studio full of art supplies. Package includes: Beka Fixed-Leg Double-Sided Paper-Holder Easel with Paper Cutter. One of the 24"" x 24"" surfaces is a chalkboard, the other is a white wipe-off marker board. 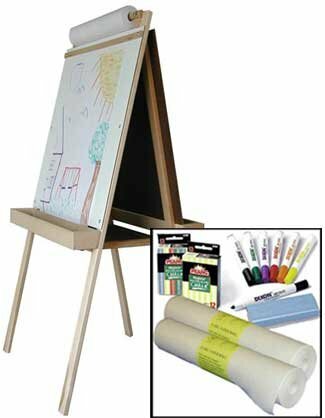 The top mounted paper holder included with this easel positions a roll of art paper above the art surfaces, where it is very easy for children to pull down and create art to save and hang in their gallery. The paper stays in place even when the easel is folded for storage. 47-1/2"" high. Built-in paper cutter holds paper flat on top and aids in tearing off finished artwork. A handy center surface area doubles as a locking system, yet easily folds up for storage. Handy natural wood trays. We have the same easel available with red plastic trays. Beka Paper Roll Refills (2) - Lots of creative space for little artists. Pack of two paper rolls. 16 1/2"" wide by 100' long. Provides lots of creative space. Paper is 60 pound white vellum offset paper which is used by many commercial printers. This high quality paper is suitable for a wide variety of uses. Beka Whiteboard Markers & Chalk - Here's everything you need to let your little artist start creating on chalkboards and wipe-off markerboard and easels. Dixon Dry Erase 8-Color Wipe-Off Marker Set includes red, green, blue, black, yellow, orange, purple and brown. 24 sticks of Prang dustless, non-toxic chalk includes 12 white and 12 colored sticks in 6 different colors. Beka easel replacement paper rolls are 16 1/2"" wide by 100' long. Paper is 60 pound white vellum offset paper which is used by many commercial printers. This high quality paper is suitable for a wide variety of uses. " High Quality Easel! Very Sturdy! Very Safe! Everything you need to start creating masterpieces! If you have any questions about this product by Beka, contact us by completing and submitting the form below. If you are looking for a specif part number, please include it with your message.